This furnished, turn key Connors Lake gem&apos;s a must see! 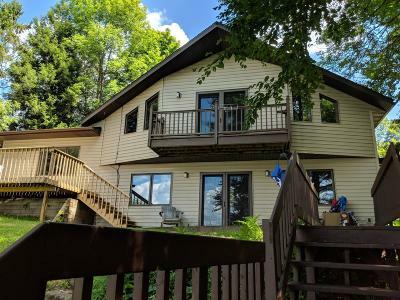 Here, enjoy having the best of both worlds on a spacious wooded and landscaped lot with panoramic lakeside views and over 100&apos; of sandy frontage, with direct access to snowmobile and ATV trails, and near thousands of acres of Flambeau State Forest! Inside, you&apos;ll love the open floor plan, cathedral ceilings, new kitchen counters and spacious family room. This home offers the ideal atmosphere for entertaining family and friends, and the spacious main floor bedroom offers plenty of room for guests. If you enjoy the outdoors you will love the outside living areas! There are three decks, one with space for a hot tub, as well as a lakeside deck and upper balcony off the master bedroom suite. There is a 24x36 detached garage as well as a 24x26 insulated workshop/gameroom with heated floors and water that could double as a guest bunkhouse. If you&apos;ve been dreaming of lakeside living on pristine Connors, now is the time to make your move!